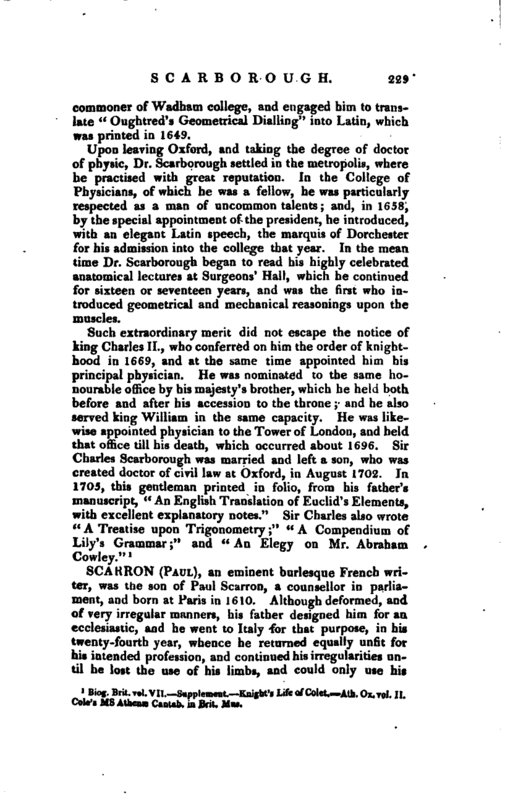 , an eminent burlesque French writer, was the son of Paul Scarron, a counsellor in parliament, and born at Pari’s in 1610. Although deformed, and of very irregular manners, his lather designed him for an ecclesiastic, and he went to Italy for that purpose, in his twenty-fourth year, whence he returned equally unfit for his intended profession, and continued his irregularities until he lost the use of his limbs, and could only use his | hands and tongue. This happened in his twenty-seventh year but, melancholy as his condition was, his burlesque humour never forsook him he was continually talking and writing in this strain and his house became the rendezvous of all the men of wit. Afterwards, a fresh misfortune overtook him: his father, who had hitherto supplied his wants, incurred the displeasure of cardinal Richelieu, and was banished, and although Scarron presented an humble request to Richelieu, which from its humour pleased that minister, no answer appears to have been returned, and both Richelieu and his father died soon after. Scarron at length, helpless, and deformed as he was, conceived thoughts of marriage; and, in 1651, was actually married to mademoiselle d’Aubigne, afterwards the celebrated madam de Maintenon, who lodged near him, and was about sixteen years of age. Unequal as this match was, she, had influence enough to produce some salutary change in his manners and habits, and her wit and beauty served to increase the good company which frequented his house. 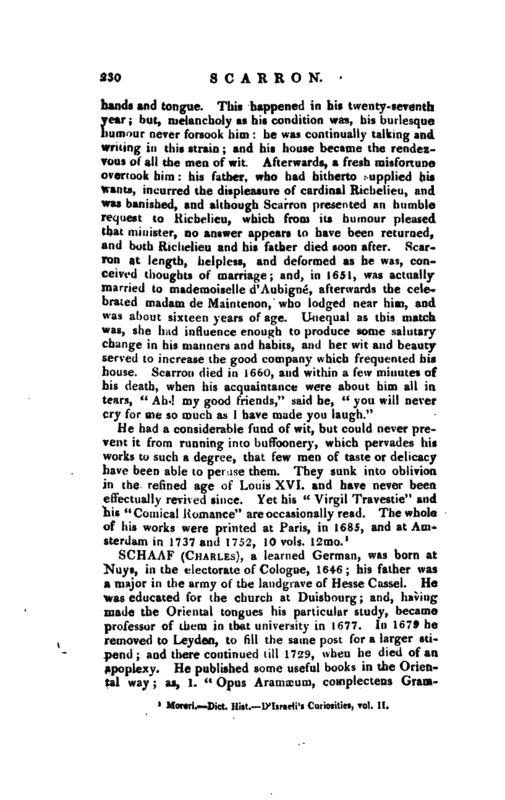 Scarron died in 1660, and within a few minutes of his death, when his acquaintance were about him all in tears, “Ah! my good friends, 7 ' said he,” you will never cry for me so much as I have made you laugh." Moreri. —Dict. Hist. D’Israeli’s Curiosities, vol. II.